Yahoo announced it’s bringing free video calls to iPhone users with its updated messenger app last week and now the app is up and running in the App Store and you can start making free video calls over 3G or Wi-Fi right now. Users can make video calls, stream live video one-to-one and the best part is that you can now make video calls between an iPhone and an Android device (if it has a front-facing camera) or between an iPhone and a PC. 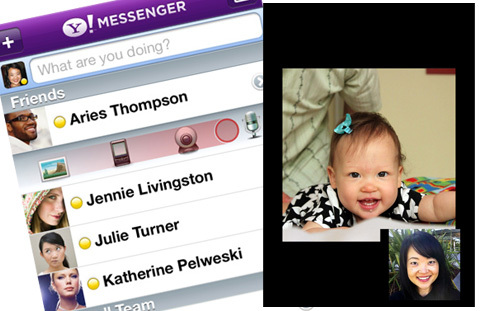 There are bonus features in the app for frequent Yahoo messenger users who can make free voice calls to their friends added in the messenger and users in the US, France, Germany, Spain and Singapore can also make low cost international calls with their Yahoo Voice Phone Out account. The app is designed to support multitasking on the iPhone so it runs quietly in the background while you perform other tasks on your device. The app is free to download and will run on iPhone 3GS and 4. You can download the app here.